NYC, 02/25/2019, 2:00PM. 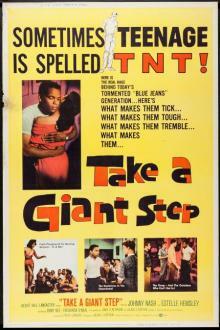 Take a Giant Step (1959): Teenager Facing Racial Issues. A coming-of-age drama about a black teen struggling to find his way in a predominantly white town. After being expelled from school, he wanders into the black section of town and is introduced to a new way of life. 100 min. Director: Philip Leacock. Stars: Johnny Nash, Estelle Hemsley, Ruby Dee. The movie was adapted from the Broadway play with the same name by Louis S. Peterson. Take a Giant Step has a nomination for Golden Globe Award for Best Film Promoting International Understanding and Hemsley was nominated for a Golden Globe Award for Best Supporting Actress.